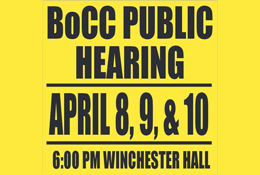 On April 8, 9 & 10, the Frederick County Board of County Commissioners will hold another in the series of public hearings that have witnessed many hundreds of people voice their displeasure about the proposed Monrovia Town Center. This is a very important set of hearings and it is vital that you attend if you are concerned about this development. 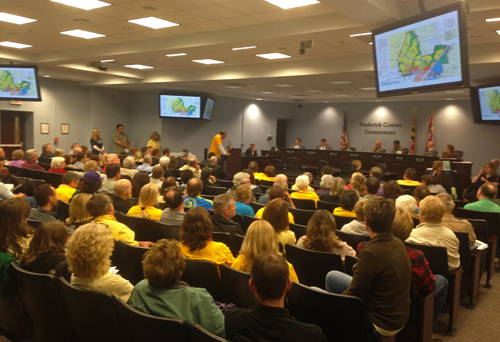 At the Planning Commission hearings last week, they didn’t see the 350-400 people that attended the hearings in October. Rather than assuming that people might be worn out and frustrated with the process, they interpreted the lower turnout as a sign that people were satisfied with the revisions they have made to the development plan. I don’t think you’re happy. I don’t think you’re satisfied. To prove it, you have to show up, sign up, and speak up. 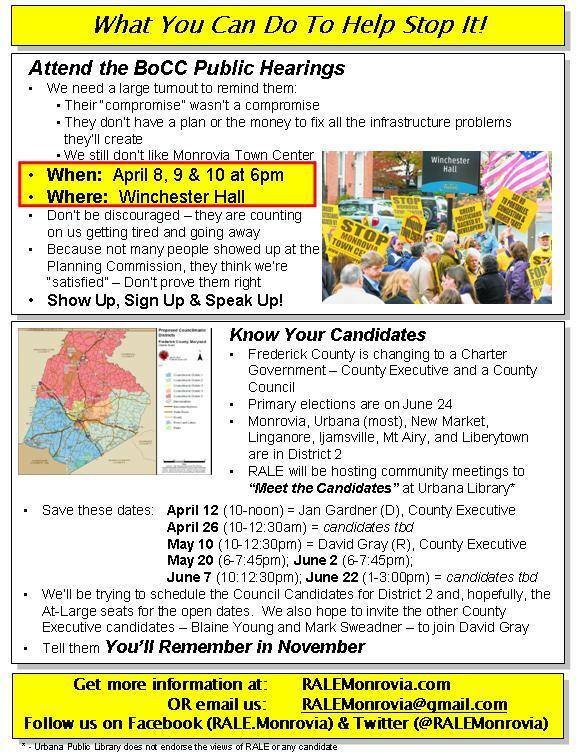 That starts on Tuesday, April 8th, at 6:00pm at Winchester Hall. As before, there are two parts: First the zoning amendment, followed by the Development Rights and Responsibilities Agreement (DRRA) and the associated Adequate Public Facilities Ordinance Letter of Understanding (APFO LOU). At the end they will vote on the DRRA and APFO LOU plus the zoning amendment, if they hadn’t already done so. Here are a couple thoughts for you. Remember all those questions about the roads and schools and more that they didn’t let citizens ask? Well this time around they can’t cut you off. Ask your questions! This is our final opportunity to get important concerns and issues into the public record. If something isn’t in the record, it can’t be considered as part of any legal appeals. This is also your final opportunity to influence these decision makers. Revised Monrovia Town Center Concept (with circles added). Did you know that every member of the Board of County Commissioners is running for elected office this Fall? Believe me, with the exception of David Gray, none of these guys want to still be hearing and reading and talking about Monrovia Town Center. They want it done. They want to move past it. They want it to be a distant memory by the time the elections roll around. I don’t know about you, but I have no intention of letting that happen. I know it’s tiring, and frustrating, but we need to keep at it a little longer. We need to show up. We need to speak out. If you don’t think this development is right for this community, then say so. 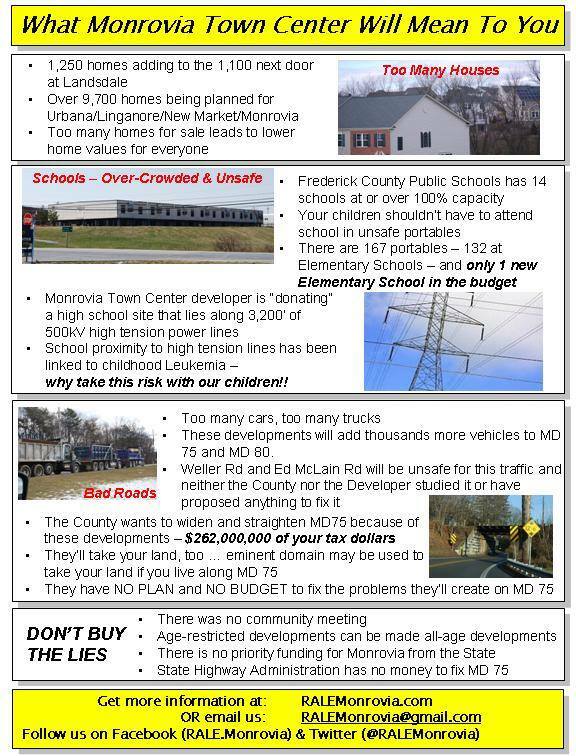 If you don’t think the County has any plans or budget to fix MD Route 75, then say so. In fact, if you know that “fixing” MD Route 75 means that you will lose part of your land and/or that it will harm your property values, then say so. If you think that our schools can’t handle this development, then say so. And finally, if you are tired of the lies and half-truths, and if you are tired of a county government that only seems to care about developers, then say so, clearly and emphatically. Many of you living outside of Monrovia may wonder what “all the fuss” is about? Monrovia Town Center is part of a development plan bringing more than 10,000 new homes to a relatively small area in southeastern Frederick County. The impacts of that development will be felt in a number of ways throughout the entire county. Your schools will suffer. These developments will mean that four (or perhaps five) new elementary schools will have to be built to serve the new residents. Because of the specific approvals and agreements that go with them, the impact and mitigation fees will not provide remotely adequate funding to build the schools they will require. Among other things, that means taxpayers everywhere in the county will have to cover the cost. It also means that if your community has an older school in need of rehabilitation, expansion or replacement, those important projects will become a lower priority than building these new schools. Your children’s schools will be negatively affects, or you taxes will increase, or both. In addition, it is estimated that the Monrovia developments will require more than $262,000,000.00 to sufficiently address major safety and traffic concerns on MD Route 75. The developer will pay only a small fraction of that cost, and, again, area residents will either have to live with unsafe and highly congested roads, or all county taxpayers will have to pay the difference, or both. Looming Bond Debt. Studies show that growth through residential development costs more in the services required to support those new residents, than the tax income from those new tax payers. When you then factor in major capital costs like new schools and roads, the problem worsens dramatically. Through this rush of development, Frederick County is gearing up for a massive wave of bond debt in the future. Click on the graphics below to open a larger version. 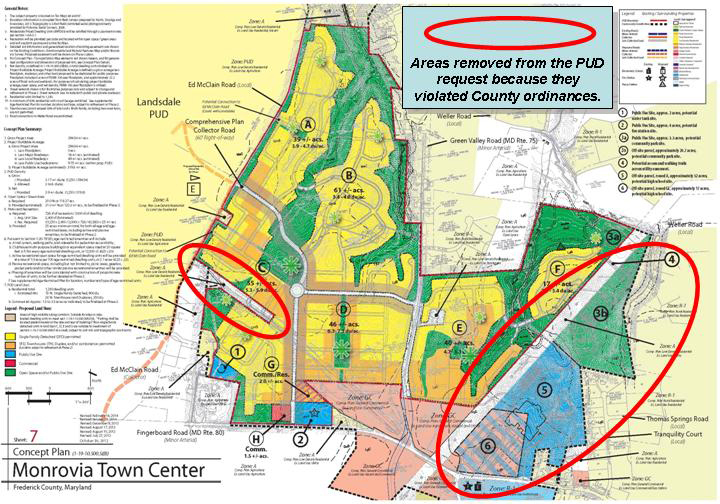 RALE – Residents Against Landsdale Expansion on the web. RALE – Residents Against Landsdale Expansion on Facebook.